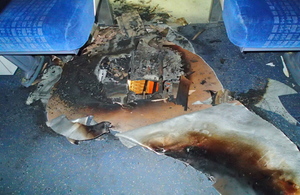 RAIB is investigating a train fire that occurred on Friday 30 January 2015, and which caused serious damage to the structure of the train. The 19:53 hrs South West Trains service from Windsor & Eton Riverside to London Waterloo had travelled about 400 metres after starting from Windsor station, when a small bang was heard under the sixth carriage of the ten-carriage train, followed by about five seconds of severe sparking and flashing. The train, which was formed of two class 458/5 electric multiple units and was travelling at about 15 mph at the time, stopped immediately. Some smoke entered the carriages through ventilators. There were two passengers in the sixth carriage, and they moved quickly into another part of the train. The guard of the train moved from the rear to the sixth carriage to investigate, and the driver also moved to the middle of the train. They could see that there was still smoke coming from below the sixth carriage, so the driver returned to the front of the train from where he contacted the signaller by radio to ask for the electric power to be switched off. While he was doing this, the floor of the sixth carriage was penetrated by fire, and smoke rapidly filled the vehicle. There were eleven passengers on the train. The guard, assisted by the crew of another train that was in Windsor station, evacuated the passengers to the track, and helped them walk back to the station. The fire brigade were called, and confirmed by 20:50 that the fire was out. None of the passengers were hurt, but the guard was taken to hospital and treated for smoke inhalation. RAIB’s preliminary examination found that the fire had originated in severe arcing in a junction box fixed under the carriage floor, where power cables from the collector shoes on either side on the train are connected to the main power cable (‘bus line’) which runs along the train. The arcing had burnt through the floor of the carriage, and had also destroyed parts of the structural members of the carriage body. RAIB’s investigation will focus on the cable joint in this junction box, and how this joint was designed and assembled. It will also examine how the train’s structure and equipment, and the people in it, might have been protected from the consequences of a failure of this nature. Our investigation is independent of any investigation by the Office of Rail Regulation. We will publish its findings, including any recommendations to improve safety, at the conclusion of our investigation. This report will be available on our website.